Don’t miss out on this special time of year for the Parrtjima Festival while still taking in all of those must-see Red Centre icons! Enjoy a night at the Parrtjima - Festival of Light in Alice Springs. Traverse the rugged country to our monolithic Uluru. Breathe in the tranquil isolation with a good meal during the Sounds of Silence dinner. Soak up the surreal ambience of the Field of Light. 2 night stay in Alice Springs at Doubletree Hilton Alice Springs including breakfast. Free evening to explore Parrtjima Festival. Afternoon ‘A Town like Alice’ tour. 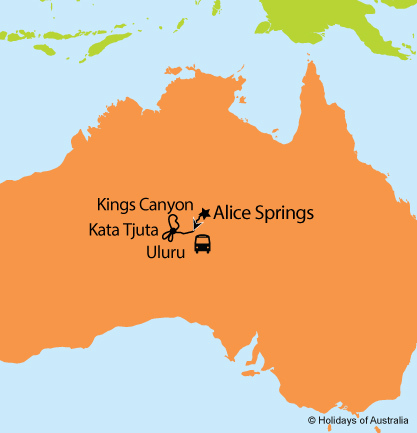 3 day Kings Canyon and Uluru Explorer staying at Ayers Rock at Sails in the Desert including BBQ Dinner. Sounds of Silence Dinner & Field of Light.